Query: We have regular enquires from professionals looking for resources to help them with their work with children who have English as an additional language. 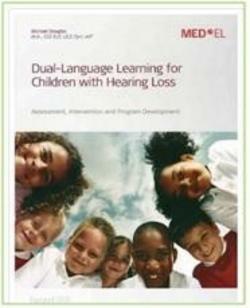 Here is another link to a new resource from MED -EL and excellent book from a clinical specialist in the field of EAL. This resource from MED EL written by Michael Douglas, (M.A., CCC-SLP, LSLS Cert. AVT) draws on his vast experience of working with families and young children with hearing loss who come from families that speak more than one language with a range of proficiency in the differing languages. The resource was developed to assist professionals with issues surrounding assessment and intervention for children with a hearing loss who are culturally and linguistically diverse (CLD). It also provides a guideline for administrators in developing a program for bilingual children.